< Previous Character of the Week: Burglar… PLUS BONUS! Next > Vengeance is Mime! Purple is the color of royalty almost universally. Try drawing a zombie next time… and here’s an idea: A BACKGROUND!!! I know you’re concentration is characters, but sometimes a part of a character is it’s environment. What would Swamp Thing be without his swamp? Plus it’ll show u can do more than exaggerated faces and bodies. Make them live in SOME sense of the world. At the very least give them shadows to evoke weight and space and being grounded. Have you seen or read Amityville Horror? In it the father/husband sees a pig-man creature. Say like a pig-otaur (pig + minotaur) demon thingy. I’ve always wanted to draw a zombie version of such a thing. If u want, run with that idea! For research, try looking up Kamapua’a. Even if u don’t draw such a thing, I think you’d dig on him. hen hao!! wo ai this pig! but zhe bu shir wo de pig. zhe shir ni de pig. i wish i knew how to say pig in chinese. and additionally, lincoln would be proud of this pig. they share a similar purple and amber solemnity, staring off into the future. Wow, I think I understood Annie’s comment and I’ve not studied Chinese in ten years! Go me! I think! Augh! You turned Colonel Spigot into a purple piggy bank!!!! mandarin! poetry! serious art crits! disney afternoon references! i am ecstatic that you, my kind blog commentors, are as eclectic as the nerdy subjects of my sketches–kudos to you! nathan: i gladdy you likey. wii charles: i agree with you that i need to work on bg’s, but time and laziness will stop me! illgnosis: let’s see this demon pig! annie: bu cuo, bu cuo! ni de guo yu jiang de hen hao! “zhu” is mandarin for pig, btw. and yes, this pig, like lincoln, is a very somber fellow. mark: thanks for the compliment and the poem, man! my pig and i both appreciate it. gavin: INCONCEIVABLE! 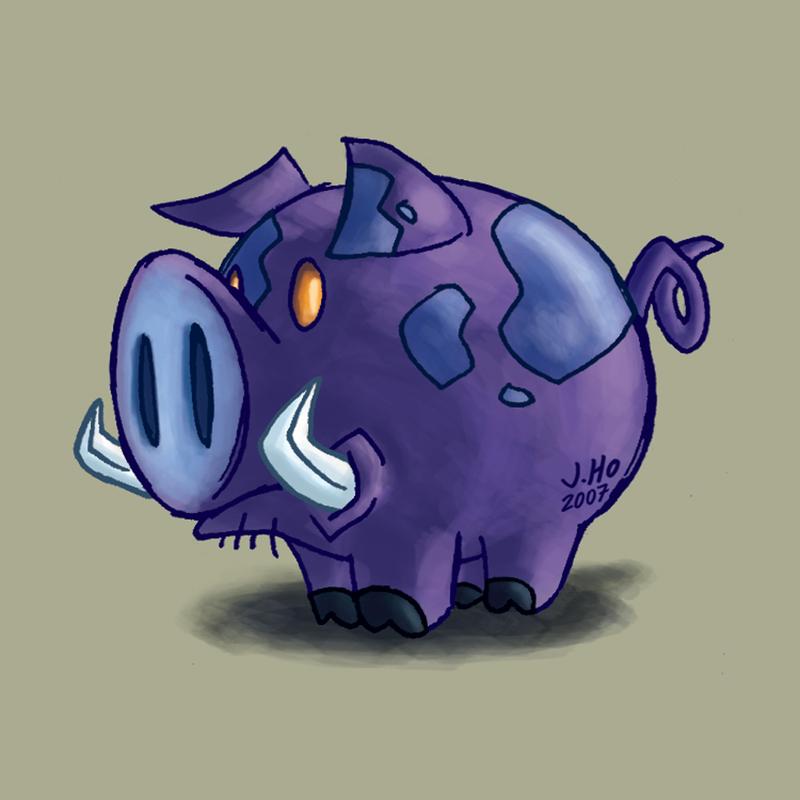 you win the no-prize for best obscure reference and for making me realize that i drew this pig as a result of the post-hypnotic suggestions that watching hours of tailspin implanted in my lower brain.